JFK meets with Admiral George Anderson in the Oval Office on October 29, 1962. During a meeting in the Oval Office on October 18, Soviet Foreign Minister Andrei Gromyko had flatly denied that the Soviets were deploying offensive weapons to Cuba. What Gromyko did not know during that meeting was that Kennedy had U-2 surveillance photos in his desk drawer that proved otherwise. In the aftermath of the crisis, when the Soviets were promising to remove their missiles from Cuba, the issue of the trustworthiness of Soviet officials became a concern of Kennedy and his advisers. The key question was whether Khrushchev’s promise to remove the missiles was genuine or whether it might be part of some trick to buy time for the missiles to be readied. 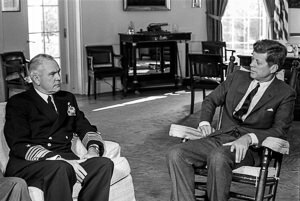 In this short segment from a brief meeting in the Oval Office at 12:30PM on October 29 with Chief of Naval Operations George Anderson and Commandant of the Marine Corps David Shoup, Kennedy complains about not being able to rely on what the Soviet Ambassador to the United States Anatoly Dobrynin said. Only two days earlier, a secret meeting with Robert Kennedy and Dobrynin had brokered the deal that eased the crisis. JFK You know, with the Russians, it just shows the last two months that whole operation they’ve run which was, you know, complete . . . They had their ambassador telling us—I mean it just shows how they’re willing to liquidate—this [Anatoly] Dobrynin is regarded very well in Russia, supposedly, is over here and has some reputation. He’s around telling—he told the attorney general [Robert Kennedy], he told [Secretary of State Dean] Rusk that they would never send missiles there. That was two weeks ago. So now he’s liquidated as a source because nobody believes him anymore. And the chances are he probably didn’t know! JFK He looked so shocked that day. When Rusk showed him [the surveillance photographs] he still wouldn’t believe it. So it’s probable they didn’t even tell him. When you’re dealing under those conditions where there is no basis—we just have to assume that we’re going to be back with Cuba in two or three months. If they start to build up their conventional forces then I think we’re going to have to say this is a breach of the spirit of the . . . Tape 32, Presidential Office Files, Presidential Recordings Collection, John F. Kennedy Library. Excerpt from a transcript that will appear in David Coleman, ed., The Presidential Recordings: John F. Kennedy: volume 4: October 29 – November 7, 1962 (New York: W.W. Norton, forthcoming 2013).